I was recently invited to play at a special celebratory evening for bassist, singer, songwriter Jack Bruce, who died two years ago. The event — held on Tuesday 25 October 2016 at London’s O2 Shepherd’s Bush Empire — was put together by Malcolm (Jack's son) and Pete Brown (Cream lyricist). 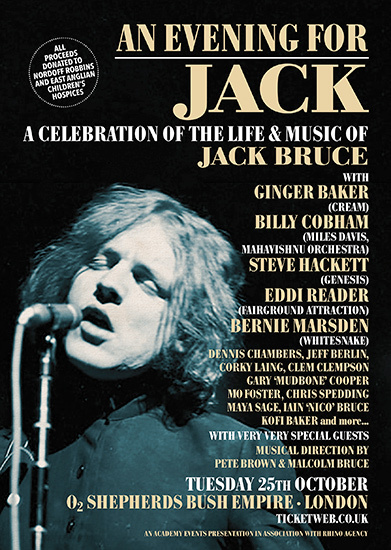 This show was a chronological musical journey through Jack's musical career, starting from the early years with the Alexis Korner and Graham Bond era, moving through the Cream era, and to his many solo records, with a nod to some of the other important collaborations during his lifetime. All proceeds went to Nordoff Robbins Music Therapy and to a hospice in Suffolk. The evening was amazing, with everyone pulling together to make it happen. There was such respect for Jack. And I got to play 'White Room' with Terry Reid, Dennis Chambers, Mick Taylor, and Will Johns — everyone else was busy! PLUS a string quartet, and backing vocals. * Towards the end of the concert Ginger arrived and made a beautiful speech that was almost a love-letter to Jack. And I got to play 'White Room' with Dennis Chambers! It’s just me and Ray telling studio stories and playing the songs. 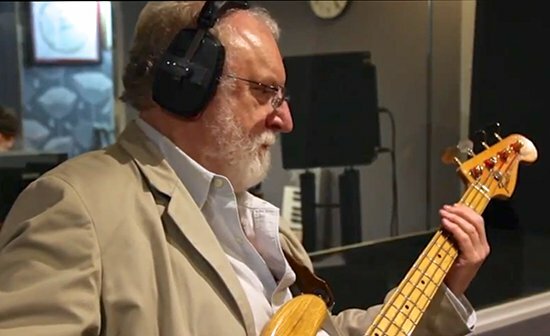 ONE MORE TIME is a feature documentary that tells the story of the UK session players of the 60's & 70's who helped forge the sound of the British Invasion and recorded the music of a generation. ‘From The Beatles to Bond and Ziggy to Zeppelin these are the tales told by the men who were there in London's busy studio scene’. ‘So far we've interviewed Clem Cattini, Ray Russell, Graham Preskett, Mo Foster, Dave Richmond, David Mindel, Alan Hawkshaw, Herbie Flowers, Martyn Ford, Ralph Salmins, Anthony Jackson, Maggie Rodford, Dougie Wright, Adrian Kerridge, Bob Henrit, David Hamilton-Smith, Vic Flick, Brian Bennett, and Simon Phillips’. ‘The film brings the players back into the studios to record as well as bringing together new interviews and some of the limited archive of the UK session players’. In the 70s and 80s there was a vibrant studio scene in London. Musicians often worked for three sessions a day, every day. Unfortunately there are very few surviving photographs or films of these events. In an attempt the redress this omission film-maker Alan Boyd recreated a studio session at Air Edel Studios for ONE MORE TIME, a feature documentary that tells the story of the UK session players. Alan is uniquely qualified to make this film as he is both a film-maker and a musician, and has a passion for both disciplines. Featured players: Mo Foster (bass guitar), Ray Russell (guitar), Brian Bennet (drums), Mike Moran (piano), Madeline Bell (vocals), Clem Cattini (percussion), Bob Henrit (percussion), Greg Walsh(producer). The musicians were filmed rehearsing, playing, arguing, telling stories, joking — just as they would on a real recording session. This interplay between these old friends was captured perfectly'.